The latest nationwide math and reading test results derived from the National Assessment of Educational Progress fourth- and eighth-grade exams are disappointing after long-sustained growth, experts say. Like the national results, scores for Illinois students on the NAEP remained flat across all grades and subjects between 2015 and the last such test in 2013. 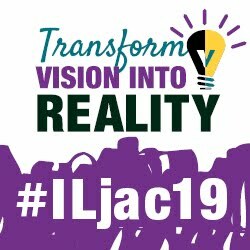 Illinois was one of 19 states showing no notable difference in math scores and one of 31 states with no improvement in reading scores. The latest state and national scores were released on Oct. 28, 2015. Specifically, the average math score of fourth-grade public school students in Illinois this year was 237, compared to the average score of 240 nationwide. 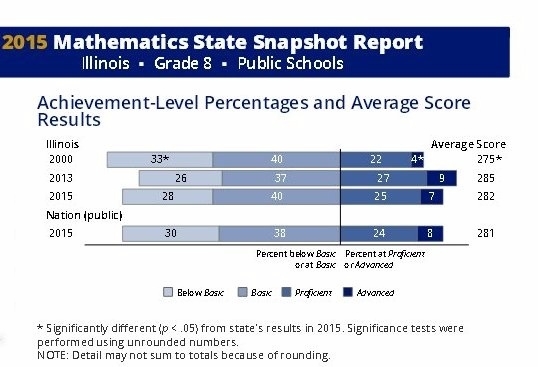 At the eighth-grade level, the average math score in Illinois was 282, compared to the average score of 281 nationally. In fact, no state made any significant improvement in eighth-grade math and only Mississippi schools made modest gains for fourth-grade math. Of the 20 large school districts that participated in NAEP in both 2013 and 2015, only Chicago improved for eighth-grade math results. When it came to reading, West Virginia was the lone state improving at the eighth-grade level from 2013 to 2015. In fourth grade reading, 11 states made significant gains. Miami-Dade, Fla., was the only district to post significant reading gains at the eighth-grade level while Boston, Chicago, Cleveland, and Washington, DC made gains in fourth-grade results. Departing U.S. Secretary of Education Arne Duncan recently blamed early implementation concerns and shifts in demographics and economics as likely reasons for the stagnating scores. The results were labeled a “fiasco” by education critic Diane Ravitch, joining with many who see them as evidence that federal education policies have long been counterproductive. While this year’s NAEP results are disheartening, other experts agree that one data point does not make a trend. NAEP scores have steadily increased over the past 25 years. In fact, since the year 2000, eighth-graders have improved their math performance by 9 points—nearly a year’s worth of learning. The long-term upward trend in Illinois scores mirrors the sustained improvement in national scores. The state’s eighth-graders in 2015 scored nine points higher in math than those in 2000, which equates to nearly one year’s worth of learning. So while scores stagnated in 2015, it does not mean the state’s public schools are becoming less effective, as the larger trend shows steady gains over the past decade. This also does not mean the 2015 NAEP results should be ignored, either. By examining NAEP scores along with other measures of school quality, educators can make more informed decisions on what is needed to support public schools. “Like any assessment used properly, educators should include NAEP results as one element of measuring student achievement and one indicator of success in a well-balanced assessment regimen that is used to plan improvement in instruction and student learning,” said Eddy.